Bacterial infection and the toxic action of clostridium may cause myopathy in horses. 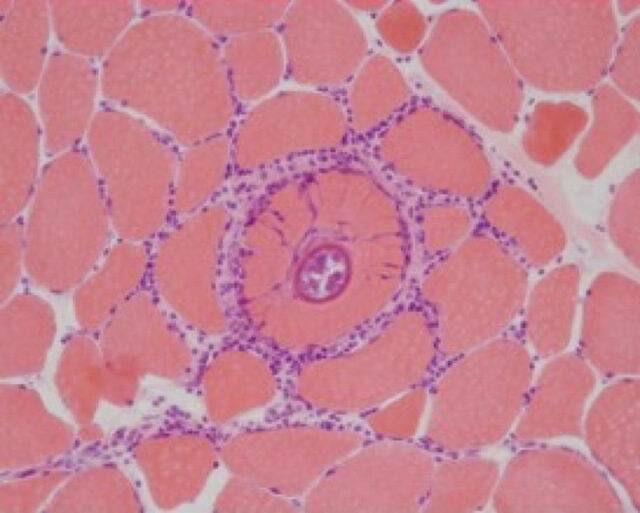 Protozoa, like Sarcocystis spp., on the other hand, are common accidental findings in equine muscle and are only rarely responsible for myositis. Clostridium septicum is the etiological agent mainly responsible for myositis in horses but Clostridium perfringenstype A and E, Clostridium chauvoei, Clostridium novyi, and Clostridium fallax can also cause infections. The clinical signs are acute presentation with heat, swelling and pain in one muscle group, fever, depression, dehydration and anorexia. 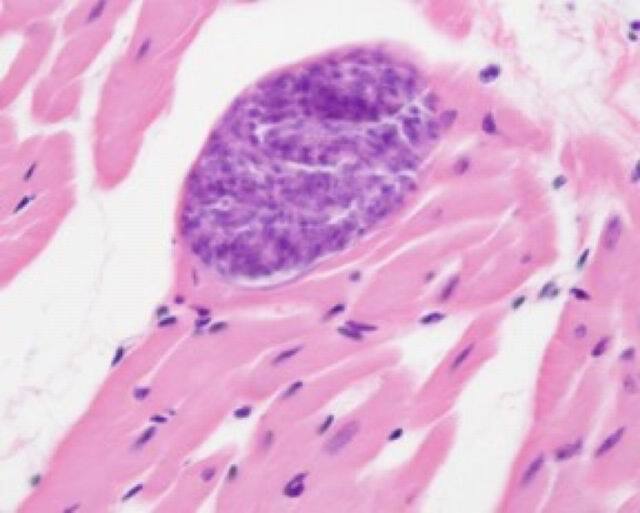 If there is necrosis of the muscle, serum concentrations of CK and AST may be slightly or moderately raised. Death through toxaemia and/or septicaemia often occurs within 48 hours. The affected muscles are swollen with haemorrhage and present with oedema, suppurative flogosis, necrosis and, in some cases, with gas. Streptococcus equi spp is the cause, in horses, of two distinct degenerative myopathies. 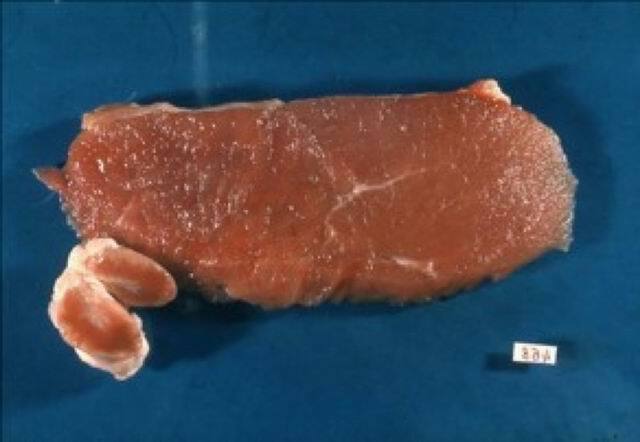 In haemorrhagic purpura muscle damage is caused by an immune response to the bacteria pathogen. The circulating immune complexes composed of immunoglobulin A (IgA) and streptococcal M antigens gather in the smaller vessels and are responsible for vasculitis and necrosis of the vessel walls with haemorrhages and infarction of the myofibres. 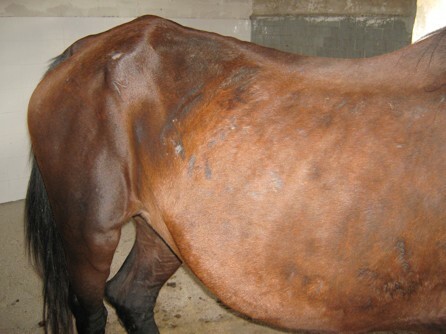 In horses, signs of myopathy are often seen alongside the systemic signs of streptococcal purpura (for example, depression, fever, oedema, petechia and ecchymosis, leukocytosis and an increase in serum fibrinogen and anaemia. Affected horses are weak, and may present with shortened stride and decubitus. Myoglobinuria is often observed and is accompanied by high levels of serum CK and AST. 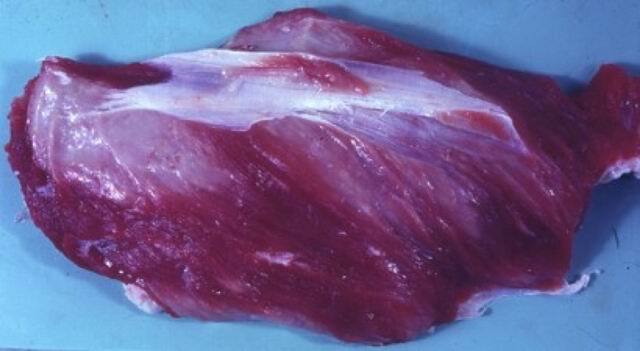 Many muscles are involved and they present with multifocal or locally extended haemorrhages and edema which dissect the necrotic muscle fibres. 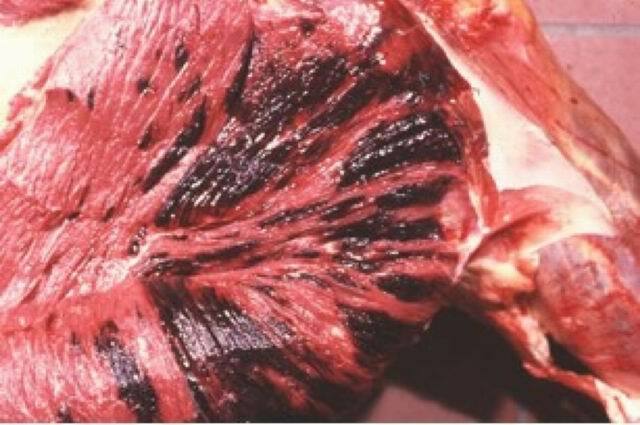 A syndrome characterized by serious, acute, deep rhabdomyolysis with generalized, rapid and progressive muscle atrophy observed in infected horses or those exposed to equine Streptococcus. Quarter horses are those most frequently affected, both younger and older animals. The muscle atrophy is often clinically most obvious on the paraspinal and gluteus muscles. 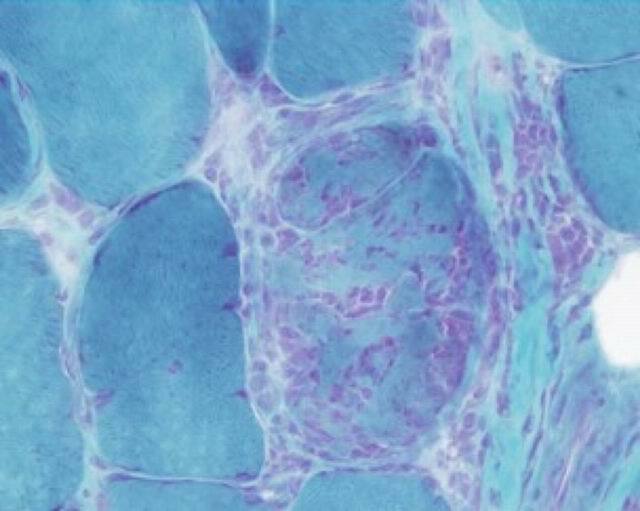 In other cases, observation of non-suppurative perivascular lesions and interstitial inflammatory lesions lead one to think of immune-mediated damage, caused by crossed reactions between streptococcal antibodies and muscle proteins. Protozoa of the sarcocystis spp type. 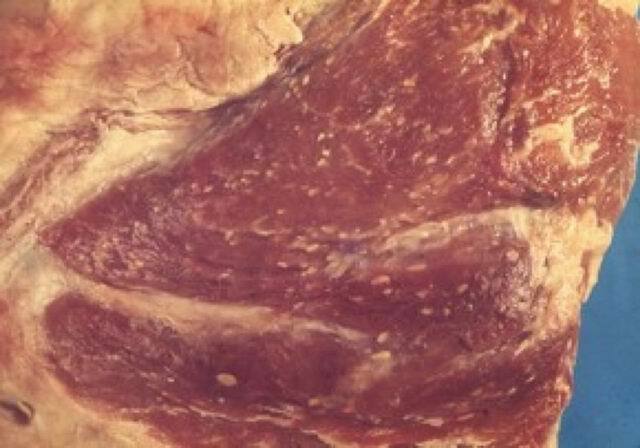 These are commonly found by chance in skeletal and cardiac muscle in equines. While ever the protozoa remain inside their cysts within the myofibres they are protected by the organism’s defence systems so there is no inflammatory response. It is suspected that massive infection by sarcocystisfayeri leads to a rare degenerative myopathy in horses. 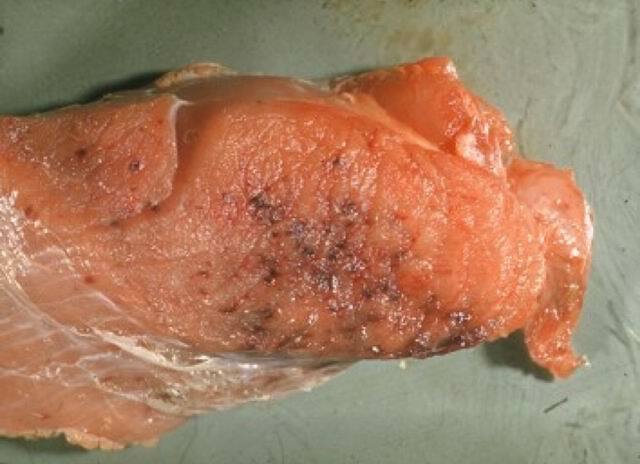 There have been a few reports of a granulomatous myositis with local thickening of the tongue because of sarcocystis in the tongue muscle in horses. Episodic muscle spasm can be observed in horses with ticks (Otobius megnini). The mechanism is unknown. Percussion of muscles may leave an impression, but myotonic runs are not visible on electromyography. Treatment for ticks brings rapid improvement in muscle symptomology.